Serving Bullsh#t News: Do You Believe In Balloon And Kite Warfare? Last Thursday morning (Aug.02/18) a news release from respected Reuters News Service served up ‘fake news,’ news that we are expected to swallow without question. Sadly, we often do! We are expected to believe that the almost completely unarmed population of almost two million Palestinians, penned, starved, dehydrated and shot in Gaza, are successfully burning up Israel with a war plan armed with kites and “helium” filled decorative balloons. Reuters even shows us pictures of a bomber with a handful of red kids’ balloons tied with a trailing string to what looks like a smoking handkerchief. And we are supposed to believe this “incendiary device” is an act of war that justifies starving and cutting off water and power to an entire population of almost 2 million humans. Did anyone you know ever succeed in aiming a balloon or a kite at a target? And how big a kite would it take to carry one hand grenade, say nothing of an “incendiary device.” Maybe the US could save half a trillion dollars a year by adopting a balloon and kite Air Force. Maybe we could stop buying F-35’s from Lockheed at hundred million dollars each, that we give to Israel (35 in 2018) and hire Palestinian, to train our warriors in kite warfare. Please tell me that YOU do not believe this nonsense! By legitimizing stories like this, Reuters News and others like it are covering for planned, slow genocide in Gaza through deprivation and disease! Israel does not use kites and balloons to kill Gazans, it uses F35, tear gas and bullets! Reuters admits that Israel has shot dead 155 or more Gazans for throwing rocks and getting too close to a fence on the last 60 days. And maybe worse, the media has conveniently forgotten some 2000 people, mostly youths, were deliberately wounded with high powered bullets during these same weeks, probably many of whom were wounded intentionally to live as cripples! Where are Reuters’ interviews with the wounded survivors? Has Reuters visited their hospital wards (if there still is a functional hospital left in Gaza (one was bombed last week). And assuming there are hospitals, how do they run without power? 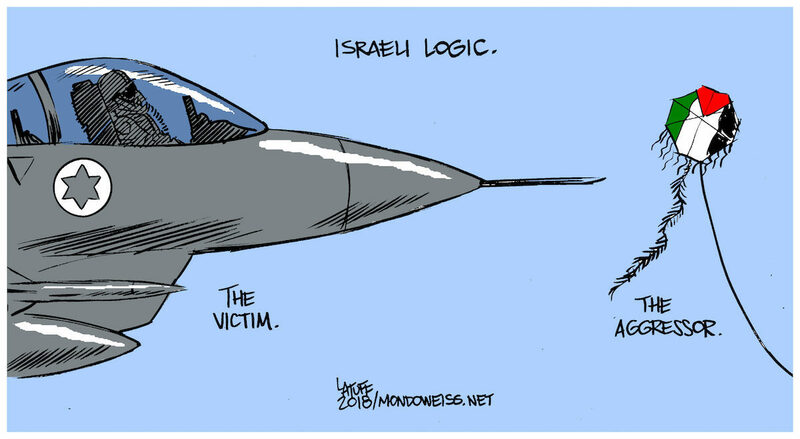 Full article here: http://whtt.org/2018/08/06/do-you-believe-in-balloon-buffoon-warfare#more-10749 Link has Reuter News quotes and there is a vid of Palestinians making bomber (wink) kites. This entry was posted in News and politics and tagged ballon warfare, Bullsh#t News, Do you believe, Kite warfare, Reuters Neww. Bookmark the permalink.